So, you need to serve someone out of state. Maybe they moved, maybe you moved, or it’s always been that way— but the big question is, how do you go about having that individual (or corporation) served? This situation happens frequently (more often than the general public may realize), with some process servers estimating that up to 25% of their serves originate from out of state, according to a poll we conducted. Although this type of service requires a little bit more work on the process server’s end, it is completely possible to have that individual served. Let’s take a more detailed look at how this process works. If you need a process server to serve your papers in another state, use our search bar above to find a process server in that area! Make sure that service can be legally attempted out of state. Cases such as real estate or motor vehicle accidents allow servers to serve defendants not residing in the state in which the lawsuit was filed. However, if you need to have a process server serve a witness or attempt service in another type of case, you or your attorney may be required to file in the state in which that person lives. If you’re an individual and unsure of how to go about filing your suit, you may want to consult a legal professional to determine the correct procedure to accomplish this. When you are faced with finding a server to carry out service upon an individual (or corporation) who lives out of state, it’s vital to understand that each state has its own legislation regarding civil process service regulations. In some counties and in certain cases, legislation may require process servers to obtain permission from the sheriff’s office or a governing body before serving the papers. For example, in Kansas, process servers must request special permission of the county clerk to serve process. This is not the case in Wisconsin, where any adult resident of the state who is not a party to the action can attempt service. Other counties or states may even require service attempts via certified mail before using a process server. The more information you can give [your process server], the better chance there is to have effective service. Rules vary from state to state, even county to county in some cases, like in Florida, and it’s unrealistic to think that our process servers will know all the nuances of the rules. We do our best to check up on them, and we have fact sheets on each state’s rules that we give our servers, but it’s important for our clients to be educated as well and inform us if there are any special circumstances or rules that we should know. If you’re looking for a resource that outlines the states that prohibit service on Sundays or holidays, see the list below. For further specifics on serving papers in a particular state, take a look at Rules of Civil Procedure by State. It’s also advisable to check with the court in which the documents were filed to see if there are any specific requirements that you might not know. It’s also important to know whether or not personal service is required, if the documents can be posted, or if the service can be made on a substitute party. You may also be required to file documents electronically or you may be required to file the original stamped documents. Beyond these general rules, a number of courts have specific documents that must be used. Your process server can help you through this process or at least point you in the right direction to find out necessary details if you’re unsure. The state in which the documents need to be served. Each case will be different, which is why Step 1 for this process is always to research the requirements for your unique circumstance so that you can come to the process server with an educated perspective. Having an out-of-state individual or corporation served is relatively simple if you’re prepared. On the surface, out-of-state service is not that different from in-state service. Just as you would with a case that is in the same state in which you filed, the first step in effectuating civil process service begins before you even contact a process server. But first, you need to make sure that you gather the information pertaining to your case and file with the proper court. Once you do this and the Summons and Complaint are ready to be served, you will want to do some preliminary research to get information on the person to be served. In addition to providing the court documents (which will have the name and last known address of the individual to be served), it is helpful to gather additional details for your process server. While the basic information provided on the court documents is enough for a server to attempt service, a current physical description of the person to be served along with any other identifiable information (e.g. they drive a late model blue sedan) is absolutely helpful for process servers. As far as information needed about the defendant, more is always better, but a name and address will suffice. In a perfect world, I would love to know their work schedule so I know when they are most likely to be at home, or what times they come and go. If I am facing a potential avoider, then things like a photograph and vehicle description would be helpful as well. If you’re already using a local process server, start by contacting them. They likely already get asked some variation of “I am trying to serve docs in Florida, but I live in Georgia, how does that work?” and are used to handling out-of-state cases. Most process servers will be happy to refer you to a colleague or affiliate if they are unable to provide service. To view a list of process servers in your state or the area where you require service (including those who offer services statewide), search using the widget below. Looking for a pre-screened process server? Type in the city or county below. Many process servers listed on our site are also members of professional organizations like the National Association of Professional Process Servers or state associations and are up to date with regulation changes and maintain proper licensing. These affiliations are listed in our member profiles. After you find a process server, you will provide them with the appropriate service documents, including the Summons and Complaint or other legal documents in the proper format. Depending on the type of service and legislation requirements, you may be able to send your server copies; however, you may be required to send the original court documents. You will definitely want to check with the courts to determine what’s appropriate in your state and county. Once the process server has determined if copies can be served, your process server may ask that you scan and email the documents, fax the documents, or potentially upload the documents online to their civil process software. The process server will then take all necessary measures to serve the documents. Once your server has completed service, make sure you are provided with a completed service affidavit that you can file with the court (some process servers may even do this for you). The service affidavit is essentially your proof that service attempts were made — it is a signed, notarized affidavit from the server in which he or she attests that they attempted service. If the server was able to serve the individual, the affidavit will also include the date and time of service, including a physical description of that individual. If the server was unable to serve the individual, that reason would also be detailed in the service affidavit. The more detail included in the affidavit the better. Randy Mucha also explained that when Firefly Legal is working with an out-of-state vendor, they review the state requirements and also “stress the importance of a properly completed, signed, and notarized affidavit returned to me in a timely manner.” Completing this last step is critical to successfully completing service. 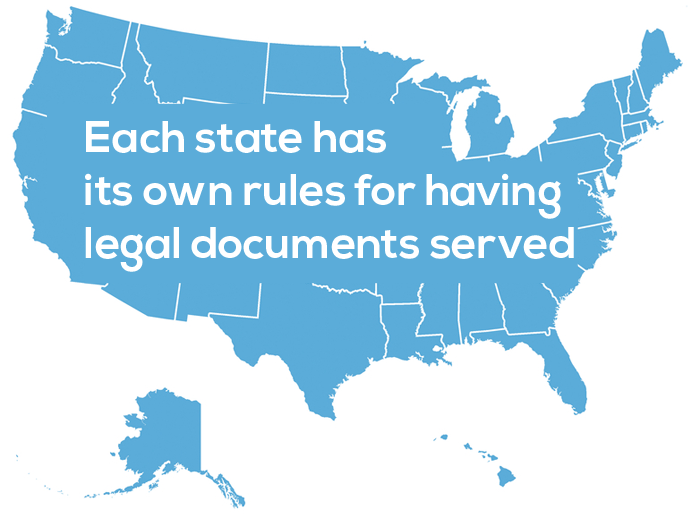 Below are some common questions about having legal documents served in another state. No matter what process server you choose, it’s important to understand that out-of-state services are typically more costly because it requires quite a bit more legwork than in-state service. This is also true even if you’re working with a large process serving company who has affiliates or vendors in the state in which you need service. Furthermore, it is often more difficult to get a current and accurate description and last known address for individuals who are out of state, and the process server you choose may need to conduct a skip trace to find that information. Expect to pay more for out of state service than you would local service. You also may be required to pay prior to service being attempted. What if I don’t know where the person lives? In some cases, you may not know where the defendant/individual to be served resides. In these cases, a process server has resources and contacts that can locate this information using a skip trace. This will produce the last known address for the person to be served, and then service attempts can be made. What if I’m on a tight deadline for a court case? Be sure to communicate the deadlines you are under to your server. Many process servers offer rush services, which allow for due process (meaning a diligent effort has been made to serve the individual). Rush service can get the person you need to be served in the time frame you need service accomplished. How will I get documents to the server? Getting documents to your server depends in part on the case itself (you may need to mail the original documents to your server — check with the court in which the case was filed) and also on your server. If copies can be served, there are a variety of ways to get the documents to your server. Your server may ask that you upload them online to their secure website. You may be asked to fax or email scanned copies of the documents. You may also mail documents. Your process server will tell you which method they prefer or require. What if the process server can’t get the documents served? If the server attempts the defendant at that address and is unable to serve the defendant, there are alternate means of service to get the individual served or notified that can be approved by a judge. Depending on the type of the case, service may be made by publication (in the event it’s a foreclosure or eviction) in a newspaper may be an option. You may be able to serve a wife or husband (e.g. substitute service). Other options include posting service (literally posting the notice on the door of the home of the individual to be served) or drop service, depending on the state and terms. In some cases, you may not be able to move forward with the case until you are able to get the defendant properly served. This may require attempting service on known aliases (which would require filing new paperwork with the court) or on new addresses once this information can be found. You also may need to re-attempt service at the known address. Regardless of the challenges in attempting service, it is highly unlikely that you would not be able to get the individual served. Improper service can derail the entire case by causing deadlines to be missed; it can even cause the entire process to start over. As with any other case, improper service can result in fees, fines, rescheduled hearings, and even dismissal of the case. Additionally, even if service attempts are made correctly, not getting a signed and notarized service affidavit— and/or not getting it back in time— can negate the service altogether. Given the potential legal ramifications and court delays, as well as differing Rules of Civil Procedure by state, it's in your best interest to contact a process server early on in this process. Earlier, we stressed the importance of finding a properly licensed (where applicable) process server who is up to date with current laws and regulation surrounding process service. The reason we stressed this is that it is important for civil process service to be conducted properly. What if I need to serve documents in another country? International service, although not as common as out of state service, is still a type of service that process servers have encountered before. In these instances, you will follow the same procedure that you follow for out-of-state service, keeping in mind that the courts and legislation is likely much different than what we have established in the U.S. In these scenarios, it's best that you work directly with a process server who has experience serving process internationally rather than trying to understand the regulations of another country. In addition to finding a process server who is familiar with serving documents internationally, you will need to do your due diligence to make sure that the service and documents are acceptable to the court in which the lawsuit was filed in the terms outlined by the presiding judge. Before initiating service, make sure you are in accordance with any treaties (i.e. The Hague Convention or Inter-American Service Convention) between the US and the country in which service will need to be conducted. You may need to have a formal letter sent by your court to the court in the country you wish to have an individual served to be granted permission. Have a government authority serve the documents. Serve the documents by certified mail. Serve the documents by publication. Have documents served in person by an agent. Have the individual sign a waiver. Service through a social media website. You will notice that a lot of these methods of service are similar to the ways in which we serve process in the U.S. This list represents some of the basic ways in which service of process can be conducted overseas. Please keep in mind that there may be more detail involved, so be sure to review the rules of service for the specific country where service would be carried out before you get started. These rules can be complex, but your attorney or international process server can help you understand the laws, or at the very least show you where you can find out more information or detail about your situation. If you find yourself in need of a process server who can handle international service, contact us and we will connect you with a server who specializes in international service. Whether you encounter a case that requires out-of-state, international, or a standard in-state service, it is our goal to make sure you are educated and have a basic understanding of how civil process service works. For more information on serving process, visit our Help Center. Note: Each process server will have his or her own process and workflow for dealing with out-of-state serves. Please remember that you may be asked for additional information or be asked to follow a different workflow and that rules and regulations differ in each state. Process servers who wish to add details of how this process works for them can do so in the comments below.